I found this photo of a page from a book on Pinterest. 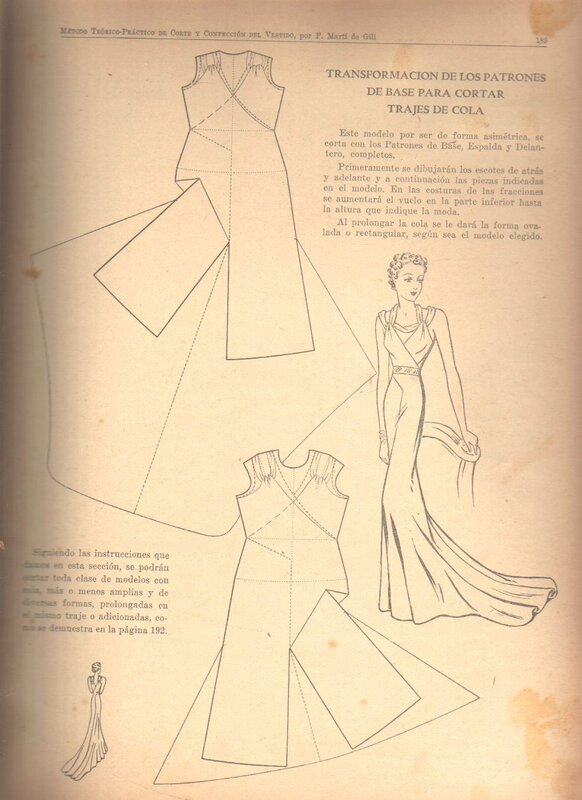 The book is Método Teórico-Práctico de Corte y Confección del Vestido, by F. Marti de Gili. This is sadly not in print any longer and copies are hard to come by. As you can see, the illustration includes the shapes of the main pattern pieces. The pattern is actually quite simple, comprised basically of just two pieces. It is figure hugging only from below the waist to the start of the hips and so there are no tight curves. As this project will take a lot of latex, and as the pattern is quite different from my previous projects, I decided to make a small scale mockup. I bought a doll from Wilkos (£3) and scaled the pattern to fit her. Despite using 0.2mm latex, it doesn’t drape the like the full scale one will. Also, the doll has a very mechanical waist and so it doesn’t site quite right either. Producing a scale version allowed me to work out the best order of construction and where to glue.